Visas are required if you enter or exit at border crossings other than the Minsk Airport, or if you travel directly to or from the Russian Federation. Typically, visas issued by a Belarusian embassy or consulate works as both entry and exit visa. 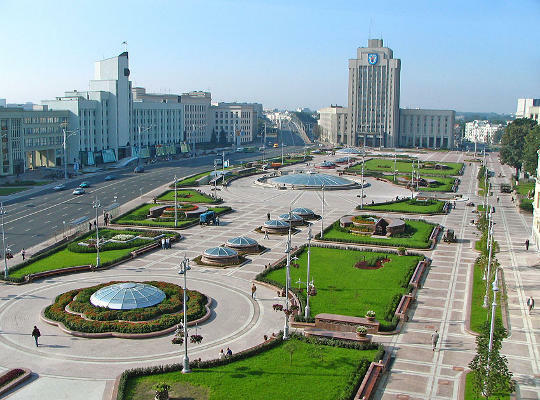 Airport visas are issued to U.S. citizens provided that an inviting person submits all required visa support paperwork to the Minsk International Airport's Consular office no later than two workdays prior to the visitor's arrival. The visitor must then submit a completed application form with 35X45mm-size photo and pay the visa fee of US $70 (applicable to both single-entry and multiple-entry visas). Visitors must register with the office of Citizenship and Migration within five days of their arrival, unless they remain for fewer than seven days. Travelers must also pay a registration fee. Hotel guests may register by checking in at their hotel, in which case the registration fee is waived. Travelers to Belarus must also fill out a migration card and carry it with them at all times. If they do not have a valid visa, current registration, and a migration card, they may be subject to sanctions. These sanctions may include deportation, and deportees may be banned from returning for anywhere between one to ten years. All visitors to Belarus must earn permission for a temporary stay (90 days), a temporary residence (1 year), or a permanent residence. Visitors may not apply for more than one temporary stay permit within a 365 day period. The Belarusian Embassy and consulates will issue temporary stay visas, and visitors may apply to the Ministry of the Interior for temporary or permanent resident permits after entering Belarus. Proof of financial means must be demonstrated upon arrival in Belarus, or during registration. The country currently requires funds in the amount of approximately USD $25/day or USD $580/month. Cash, credit cards, prepaid hotel reservations, or letters pledging financial support are all accepted as proof of funds. Medical insurance purchased at the port of entry is also required for all foreign nationals regardless of any existing insurance. Additional permits are necessary to travel into certain protected border zones. Visitors are advised to be aware of signs and barriers, and to avoid restricted areas. Religious worker visas are required for foreign missionaries who plan to engage in spiritual activities outside of their host institution. The approval process can be both difficult and lengthy. Naturalized U.S. citizens from Belarus typically retain their Belarusian citizenship unless they take specific steps to renounce it. Dual nationals may enter Belarus without a Belarusian passport, but will not be allowed to leave until they obtain one. This includes children of at least one Belarusian parent, who are considered to be Belarusian citizens until they turn 16 and can claim or reject citizenship. Dual nationals are also subject to Belarusian laws requiring military service, and may not be permitted to leave until they have completed this service. For the most current visa information, visit the Embassy of Belarus website or visit the Embassy of Belarus at 1619 New Hampshire Avenue, NW, Washington, DC 20009.